While there is no silver bullet in the fight against concerted and targeted attacks, a holistic framework that includes varied methodology and tools while embracing layered defensive tactics can prove very helpful. 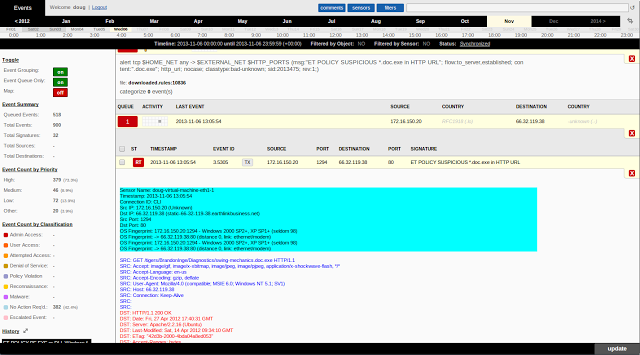 This post is a complement to the blog on APT Red Teams – Part 1 to enable a continuous improvement and optimization cycle from counter-intuitive sources and help mitigate advanced threats. Monitoring a combination of network data and host file integrity data can be key for detecting APTs. 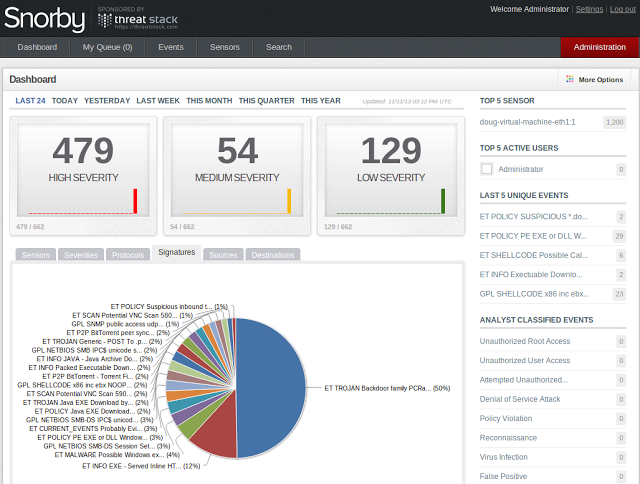 A combination of open source tools, such as Snort, Splunk, Sguil, and Squert are uniquely suited to monitor patterns of activity in data over time to see a potential attack. The information contained in this blog, together with APT Detection Framework and APT Red Teams series represents only a starting point for observing anomalous activity on hosts and on the networks and is not meant as a complete APT program. Attack vectors are constantly changing and it is up to the reader to stay abreast of conditions that may warrant changes in APT strategy or seek to partner for expertise and best-practice help. These tools fit into the general category of network security monitoring (NSM), as described in several books by Richard Bejtlich, see “The Practice of Network Security Monitoring, Understanding Incident Detection and Response” for more details. Intrusion detection (IDS) alone is sub-optimal and organizations really need a combination of tools as an NSM to deal with various data types. Sguil is the de-facto implementation of NSM. 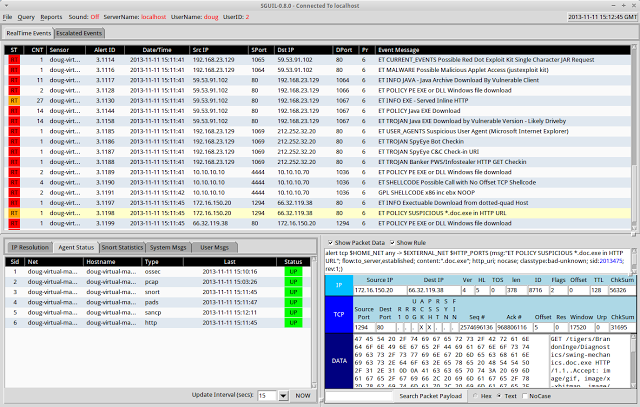 The Security Onion (SO) is a Linux distro for intrusion detection, network security monitoring, and log management. It’s based on Ubuntu and contains Snort, Suricata, Bro, Sguil, Squert, Snorby, ELSA, Xplico, NetworkMiner, and many other security tools. The easy-to-use Setup wizard allows organizations to build an army of distributed sensors for the enterprise in minutes. For more information see the Security Onion Blog. Security Onion is configured for immediate use by default. Ideally, it should be installed on dedicated hardware but short term it can be deployed via virtual machines or systems booting from LiveCD OS media. The first step to enhancing SO for optimal correlation functionality is to add Splunk. A commercial license is required for full action-based alerting, however, the limited community release can suffice with a small data footprint and console-only monitoring. Splunk installation is remarkably straightforward. It is vital to practice an elevated operational awareness around critical data and assets, for example, sensitive data (PII, PHI, CHD), source code, and intellectual property. Segment and wrap critical data in managed secure zones within the deeper protection of well monitored defensible infrastructure (see Defensible Security Posture) with network taps, network flows (NetFlow) and, logging tools to increase visibility and enable on-demand packet capture. It is impossible to protect everything equally. Incremental efforts, targeted at protecting high value data, typically through smaller and protected network segments (see Adaptive Zone Defense) provide far greater gains than broader, less focused efforts on lower value targets. Similarly, layered defensive tactics (multiple layers and means of defense) can contain security breaches and buy time to detect and respond to an attack, reducing the consequences of a breach. It is all about starting with a Back to Basics: Defensible Architecture that is well-organized and managed based upon asset and data classification and risk assessment that defines policy, placement and, controls. Even the best monitoring mindset and methodology may not guarantee discovery of the actual APT attack. Instead, use more comprehensive analysis and correlation to discover behaviors indicative of APT-related attacks, lateral movement and, data exfiltration. 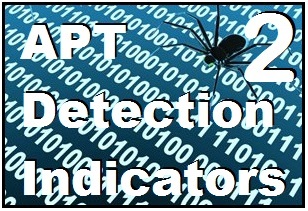 This APT Detection Indicators – Part 2 blog is a part of the APT Strategy Series and complements and builds upon the Adaptive Zone Defense, Defensible Security Posture and the APT Red Teams blogs. In APT Detection Indicators – Part 3 we will discuss the use of the above tools in more detail together with a methodology to integrate and leverage events and data. In this series we will share more Indicators of Compromise (IoC) examples and scenarios together with posts on APT Defensive Actions and Adaptive Response Strategy.